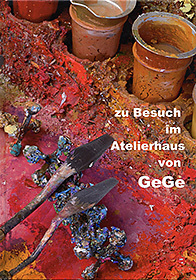 Compiled by Katharina Gessler Book format 21 x 30 cm, 60 pages with about 160 illustrations, some of which are large format and numerous artworks by GeGe (Georg Gessler). The visit to GeGe's studio house is a unique experience. The photo book gives insight into GeGe's work environment. It guides you through the etching workshop and the framing workshop, the studio and the image archive, the study rooms and the sleeping quarters. Revealing a paradise for art lovers.